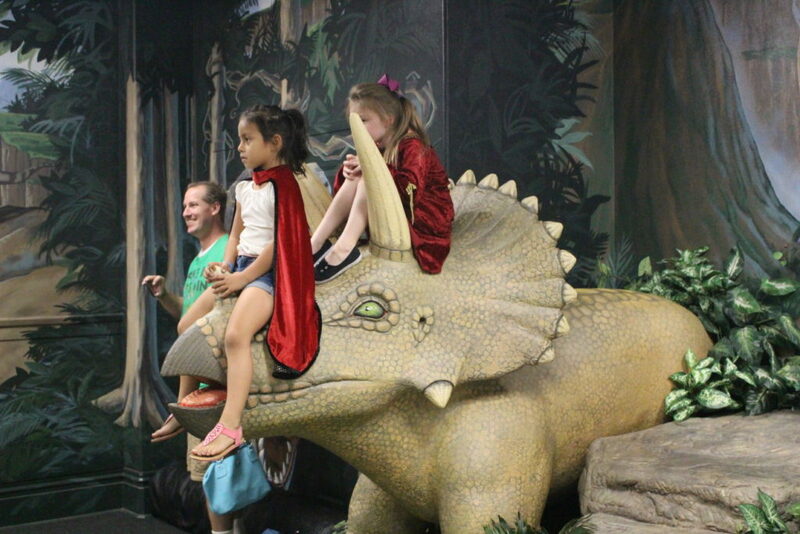 ST. GEORGE – Complete with dinosaurs, a volcano and more, a prehistoric world now inhabits a room at the St. George Children’s Museum. 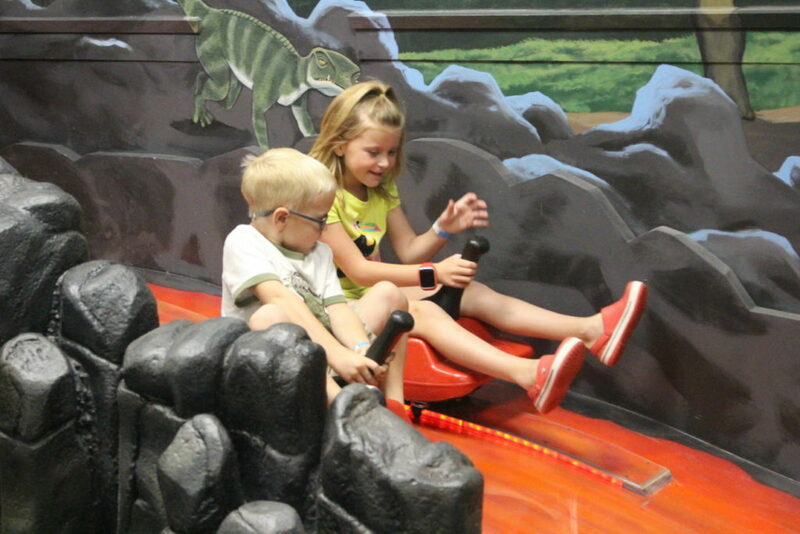 Opened to the public on Labor Day, the new dinosaur room features a volcano in one corner that children can climb into and then slide down a lava flow while steam puffs out the top. 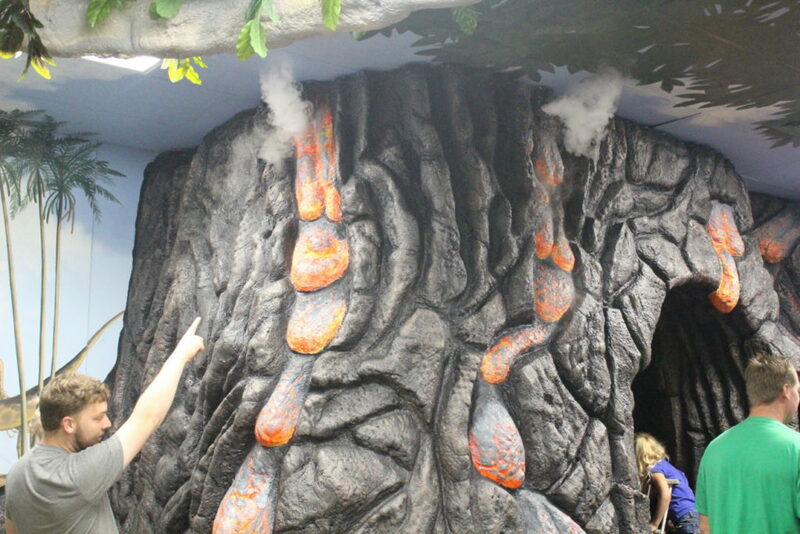 In the middle of the room reaching to the ceiling and branching out is a large tree trunk. Nearby, children happily climb all over sculptures of a triceratops mother and her child. 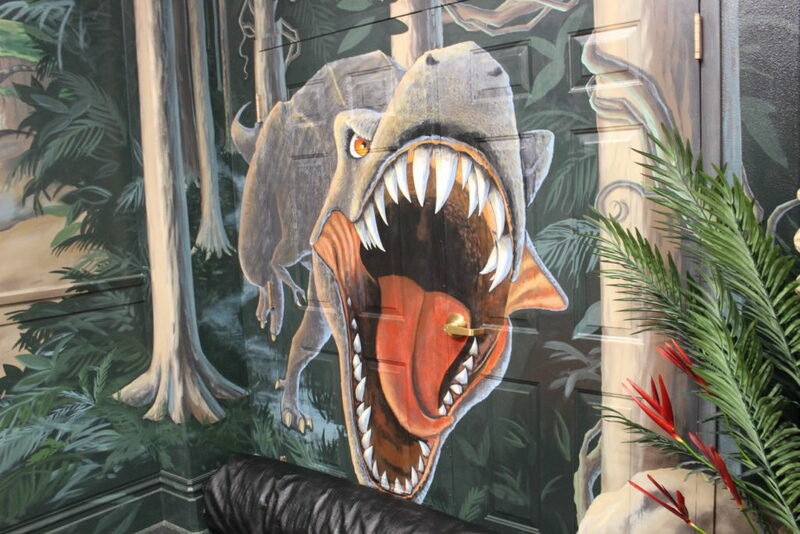 All around the room is a mural depicting the prehistoric landscape where dinosaurs live and roam. Along with it, wild junglelike sounds play in the background with the occasional shriek or roar of one of the giant lizards. 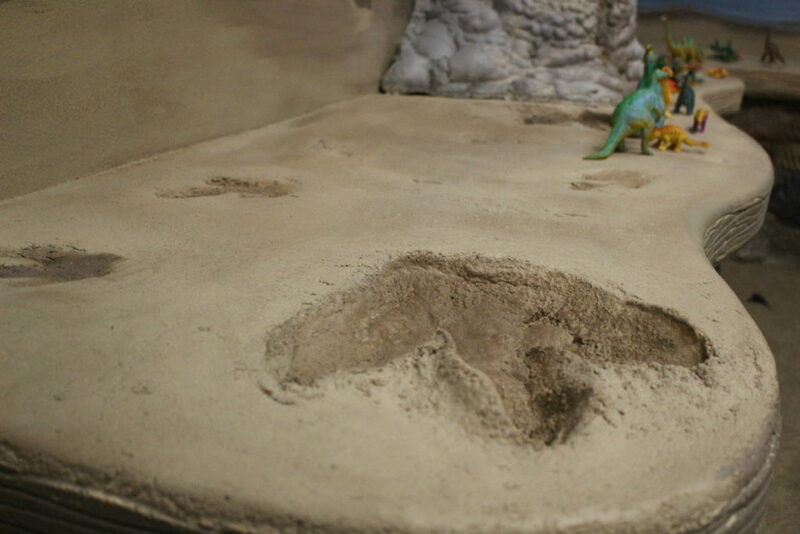 In other parts of the room, replicas of the dinosaur tracks found at the St. George Dinosaur Discovery Site at Johnson Farm are also displayed. “This is actually my favorite room so far that we’ve done,” said Anita Wotkyns, co-director of the St. George Children’s Museum. The new room is unique to others at the children’s museum since it’s the first one staff and volunteers created and built from start to finish. 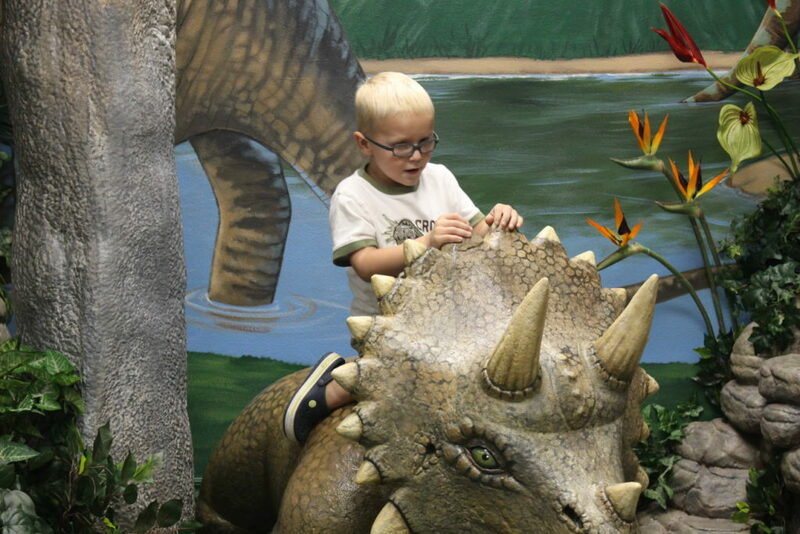 When the museum officially opened in January 2014, all of its exhibits came from the Lied Discovery Children’s Museum in Las Vegas. 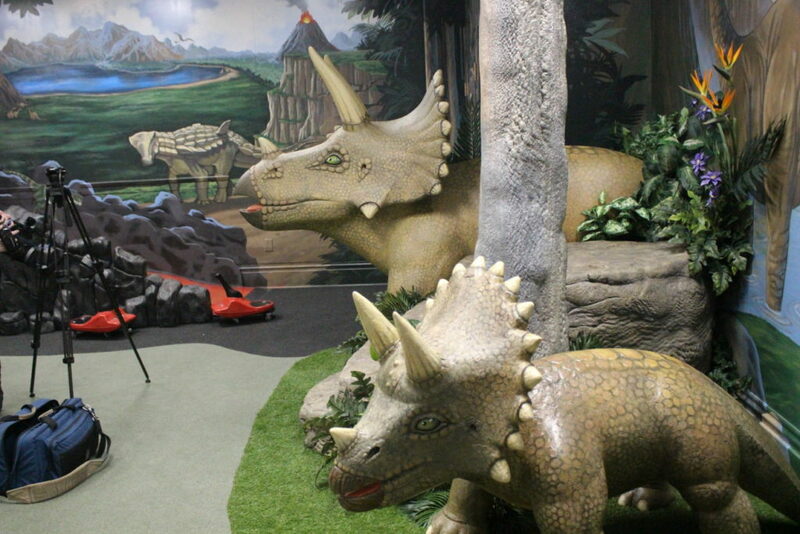 The mural that covers the walls was painted by local artist Susan Grove, of SG Murals, while the sculptures in portions of the room, such as the tree and triceratops, were created by Erik Wan-kier, of Art Escapes-3D. The dinosaur track replicas were added by Chaz Cox as a part of an Eagle Scout project. 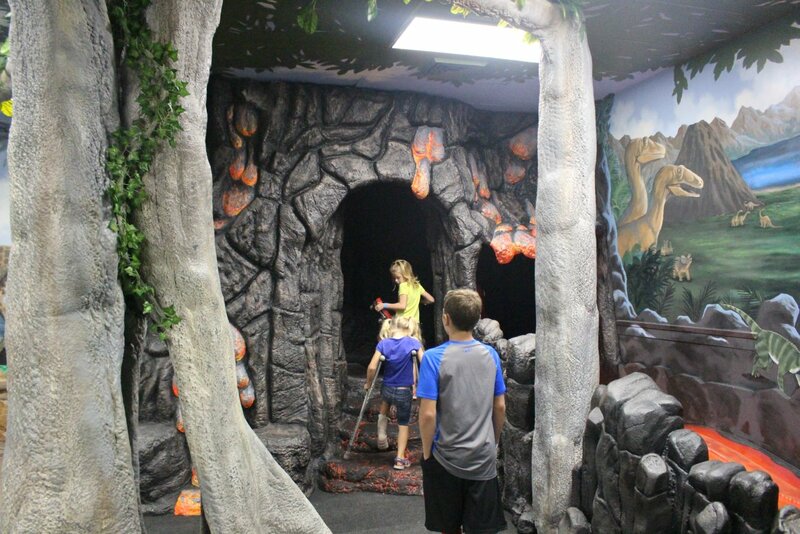 While the room is open for visitors to enjoy, some elements, such as a wall featuring touchscreen programs and the model of a pterodactyl, have yet to be added. The estimated cost and value of work put into the new room is over $60,000, Wotkyns said. As a public nonprofit, the museum runs entirely on donations and grants. Suggested donations at the door are $4 for adults and $3 for children and seniors. Whatever amount people would like to donate is accepted regardless. Located at 86 S. Main St. in the Community Arts Building next to the St. George Town Square, the Children’s Museum has drawn nearly 300,000 visits from around the county and across the globe. Shouldn’t this be listed as Science and Education, rather than Arts And Entertainment?